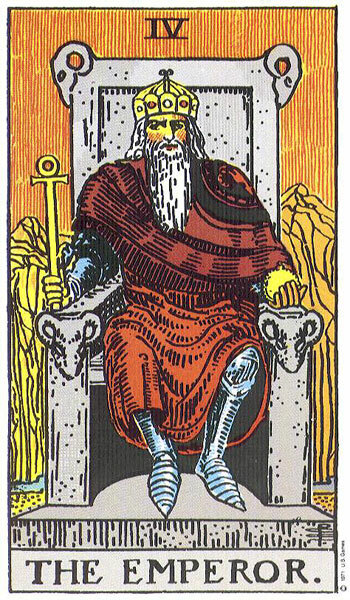 The Emperor is a Major Arcana card, and represented by a single individual on the card, which always makes the Trump seem more forceful and specific to me. 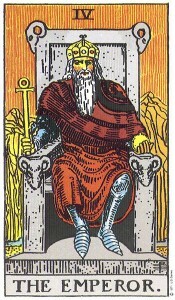 A largely positive card, the Emperor represents a person with enormous force of will, someone who gets things done and is successful. It can represent good fortune in business and entrepreneurial ventures, and is a definite sign you should “take charge” of the situation and move forward with positive action. 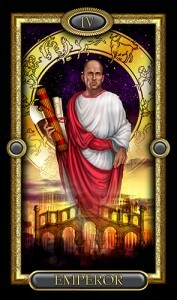 The card can sometimes have a negative overtone, if you’re dealing with someone who likes to throw his/her weight around, but more often the Emperor represents order, logic, reasoning, shrewd decision-making skills, etc. This is a card of victory and conquest. From a manifestation standpoint, it’s the card of manifesting your dreams. In a reading, this card indicates power, logic and order, dominance, conquest, and focused intention. You’ve got what it takes to make things happen, or the universe is conspiring to give you the tools to succeed!